The late Rev. Dr. Arthur Caliandro, former head minister at my church in New York, often spoke of the kindness of New Yorkers. He spoke of the ways they help each other and care for their communities. He would do this while addressing the visitors to the church, which were often visitors to the city itself. Church tourists, if you will. It’s my opinion that he did so to counter the commonly held belief that New Yorkers are pushy and rude. Truth is, we’re just busy and hurried. But like people everywhere, we have homes, neighbors we like, neighbors we don’t so much like, favorite bars and restaurants, churches, volunteer organizations, Girl Scout meetings, and family dinners. Now, over the 15-plus years I’ve lived here, I’ve come to another conclusion. If you’ve been pushed while visiting this city, there is a high probability that it was another tourist that pushed you. Traveling does something to us. While we explore and experience a new place, we also wear ourselves down and run ourselves ragged. How many times have you heard someone say about anywhere they’ve been, especially New York, “I loved visiting, but I could never live there”? Well, to that I say, “I don’t spend the whole day shopping, climbing stairs to the top of the Statue of Liberty, forcing myself through the throngs of Times Square and pretending to understand the latest exhibit at the Guggenheim”. But if you’re a tourist in a new place that’s what ya do. You squeeze as much into a day as possible. That sounds good in theory and it’s too bad we can’t live our whole lives that way. But sometimes you have to slow down. The occasional night in sleepy-shorts watching reruns of Murder She Wrote has its virtues, too. Ok, stay with me. I promise I’m bringing it back to the grumpy tourist. Now, there is an ancient street in York in the north of England. It’s called The Shambles or Shambles. As I understand it, shambles is an out-of-use term for an open-air meat-market or slaughterhouse. Also once called The Great Flesh Shambles, from the word fleshammals, literally meaning “flesh shelves”. But I digress. The rows of butcher shops are long gone and it is now a charming lane lined by historic buildings, many Tudor, some dating as far back as the fourteenth century. Now filled with eateries and souvenir shops, it is one of the most photographed streets in Europe. 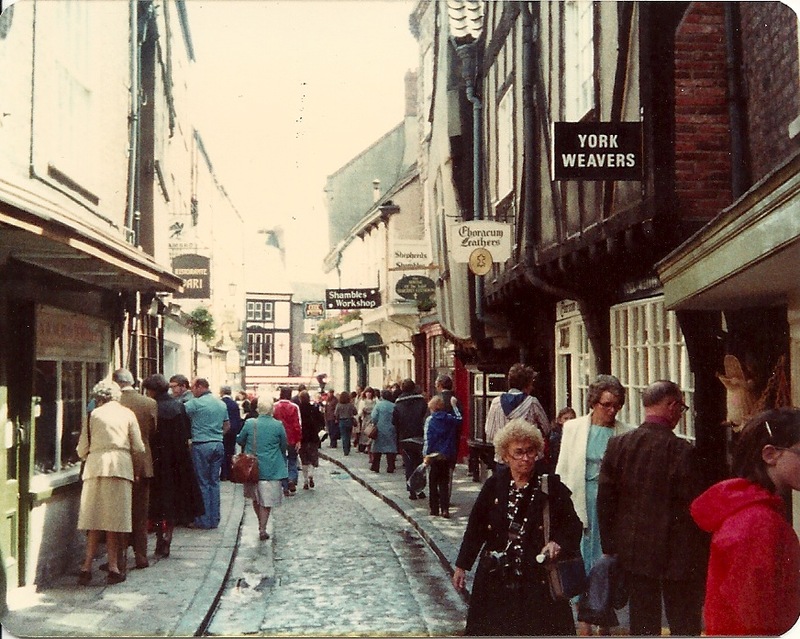 That’s her there on the right in the dark jacket and glasses in this great shot that my Papa took on The Shambles over 30 years ago. To be honest he was likely only taking a picture of the street and she happened to be in front of the camera. That was often the way of their shots. But more on that in another post. In this picture, she is walking quickly down a tourist filled street covered in what I can only believe is recently fallen rain water. Now, I can’t pretend to know where all she’d been that day. But I can tell you how I got there. At 730am on that early Monday morning, I got a wakeup call from the front desk. I rose, showered, made some instant coffee (the British could really learn a thing or two about coffee from their European neighbors to the east) and wrote for a couple hours. Then I packed a day bag and headed to the National Railway Museum where I spent two hours searching out two locations for pics of my grandparents (see gallery above) and learning a lot more than I ever thought I would about the history of rail travel in the UK. From there I walked the mile back to the city center and walked the grounds of the Yorkshire Museum Gardens which hold the remains of the almost 1000-year-old St. Mary’s Abbey. After some time there, I found my way to the ancient city walls entering by way of the Bootham Bar. Walking a couple miles of the walls was a breathtaking experience. The views offered of York Minster and the surrounding town were inspiring. After the walls, I made my way to York Minster for a self-guided tour of the largest Gothic cathedral in Northern Europe. After an hour or so there, I settled down for a quick, if late, lunch and pint before searching out the Shambles and my Nanny. Finally, an hour before sunset I was setting up a tripod and examining windows and buildings to line up my shot. With timer set, I hurried down the street and turned in time to walk toward the camera. Click. Upon review of the picture I’d taken, I was surprised by something. I didn’t feel it, but I looked grumpy. Mouth pursed and brow slightly furrowed. I had merely intended to get a shot of myself walking where she had walked. But my face told the story of a long day of tourist activities. So I took another one. Two more actually. All hoping to look more pleasant. Then the first pic jarred something in my memory. Pulling out my computer, I opened the shot of my Nanny and zoomed in on her face. Almost identical. Lips pursed. Brow slightly furrowed. I’m sure she was as charmed and enchanted by the street as I was. But I am almost equally as sure that she was tired and over touristed. Is that a word? Microsoft Word’s red squiggly line says no. But the spirit of the word is real. Maybe we need a new entry in the dictionary. 1 drained of all kindness and patience due to over-exposure by new places or things: After a day shopping on Fifth Ave. I returned to my hotel unbelievably touristed. 2 finding oneself deeply affected by other tourists : I knew that B at Starbucks had finally gotten to me when I realized I was as touristed as she appeared to be. There. You’re welcome. Spread the word. So maybe when you travel and you’re someplace new, take your time. Take a break. A long lunch, perhaps. Make your list of the next day’s activities a dream list, not a to-do list. And then just get to the ones you can. But most of all, enjoy yourself and the people around you. Oh, and try to resist the urge to push. Touristed. It’s a new word in my dictionary, that’s for sure. I love you so much, my friend…I love being able to ‘take this adventure’ with you. And the pictures are fantastic. And the way you write is fantastic. It’s just fan-freakin-tastic! Grumpy or not, this is once-in-a-lifetime stuff. Chris, I don’t know if you remember me but I work with your mom at Nichols. I just want4ed to thank you for sharing your journey with all of us. Stay safe and have a wonderful time. this is everything. that is all.